Demetris L. Geddis is the Assistant Dean of the School of Engineering and Technology and the Chair of the Department of Electrical and Computer Engineering at Hampton University. 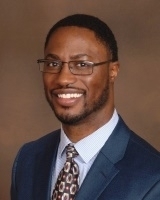 Dr. Geddis earned his Bachelor of Science in Electrical Engineering from Hampton University and Master of Science and Ph.D. in Electrical and Computer Engineering from the Georgia Institute of Technology. He has extensive research experience in the areas of Integrated optoelectronics, Optics, Microelectronics, and Electromagnetics. He has worked as a Research and Design Engineer at Motorola and Bell laboratories. Also, he worked at NASA Langley Research Center as a NASA faculty fellow for the Nondestructive Evaluation Sciences Branch where he performed research in the area of optical fiber sensing for real time health monitoring of aerospace vehicles. Current research interests and publications are in the areas of Photonics, Optoelectronics, Microelectronics, Heterogeneous thin film integration, single-fiber bi-directional communications, optical sensing, and ring lasers. In addition, Dr. Geddis was a Research Engineer at the Georgia Tech Research Institute where he fabricated scalable multiplexed ion traps for quantum computing applications. Prior to joining HU, Dr. Geddis was an associate professor at Norfolk State University where he served as a Graduate Program Coordinator, Department Advising Coordinator, and Director of the Micro- and Nano- Technology Center Cleanroom. Dr. Geddis serves as the Vice-Chair of the Hampton Roads Section of IEEE and as the Chair of the Photonics Society of Hampton Roads.